▶ If not in the competition, dogs were not permitted in Piedmont Park during the festival. 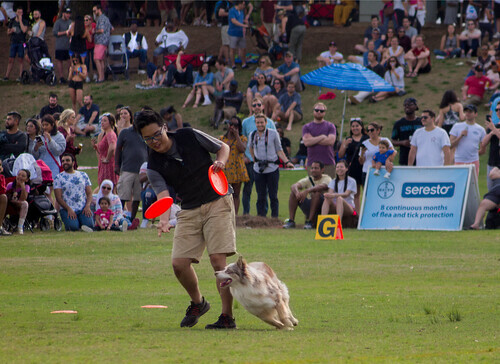 Unfortunately, several spectators flaunted this rule and Hype's routine was disrupted twice by dogs running onto the field of competition. By his second do-over (3rd time on the field), Hype seemed a bit gunshy and didn't perform as well as he had. He received a loud, sustained ovation from the crowd for his perseverance.